Stadium Financing City-issued bonds serviced by stadium revenues. Naming Rights Cinergy Corp. paid Hamilton County $6 million for 6-year naming rights starting in 1996. Payments made over 5 years. "The no frills atmosphere in Cinergy Field (formerly called Riverfront Stadium) goes with the city's buttoned down image like a cardigan sweater. The franchise founded by legend Paul Brown believes that fans come to see football and not a circus, so you won't see much to distract you from the action. The field has no logos or marks on it other than the hashmarks and sidelines; there's not even a Bengal logo in the end zone. (In 1985, when the Reds marked the spot of Pet Rose's hit that broke Ty Cobb's record, the Bengals erased it for their next game, even though it wasn't on the field of play.) You won't see mascots, either. Safety concerns benched Benzoo, a white tiger cub that the Cincinnati Zoo brought to the games for years. But the club did bring back the Ben-Gals cheerleaders in 1994 after an absence of several years, and banners in good taste are encouraged. The city-owned stadium is the typical multi-purpose facility built in the early 1970s, and while it's functional, it has little character. The setting is just fine, on the banks of the Ohio River next to the historic John A. Roebling Suspension Bridge. Fans can walk from the heart of downtown by using pedestrian bridges. Bengal fans do get cranked up when the team is winning. Though New Orleans gets credit for it, the "Who Dey" chant started in Cincinnati in 1981 as the Bengals marched to the Super Bowl. It goes, "Who dey think gonna beat dem bengals? Noooo-body." And it's still used (under appropriate game conditions)." Despite Cincinnati's love of baseball, it was the prospect of a professional football team that finally moved the city to end twenty years of discussion and build a new stadium on the downtown riverfront. 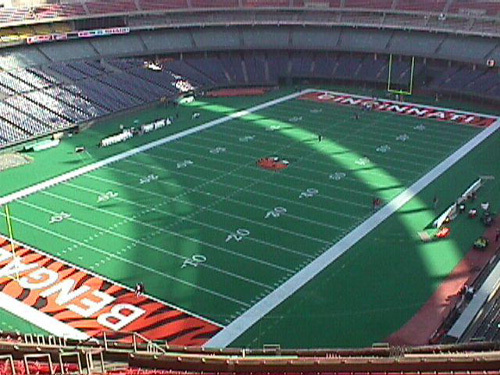 After playing for two seasons at Nippert Stadium on the University of Cincinnati campus, the Bengals built on the Reds' success in the stadium's first year when they recorded their first winning season and first playoff appearance in 1970, just their third year of existence. 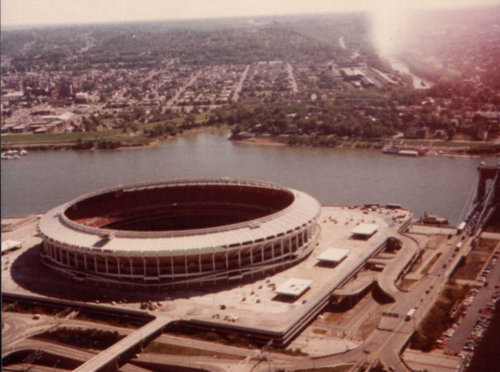 Perhaps the most memorable football game at Riverfront was the AFC Championship on January 10, 1982. The game became known as the Freezer Bowl and was won by the Bengals over the San Diego Chargers, 27-7. The air temperature during the game was -9ʡF (-22.8ʡC) and the wind chill was -59ʡF (-50.6ʡC), the coldest in NFL history. The win earned the Bengals their first of two trips to the Super Bowl (XVI) while playing at Riverfront. 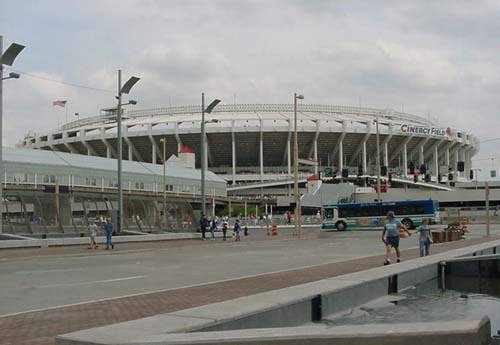 Riverfront Stadium hosted the 1988 AFC Championship, as the Bengals beat the Buffalo Bills 21�10 to advance to their second Super Bowl appearance. During the Bengals' tenure, they posted a 5-1 record in playoff games played in Riverfront Stadium, with victories over the Buffalo Bills (twice), San Diego Chargers, Seattle Seahawks, and Houston Oilers. Their only home playoff loss came to the New York Jets.